If you’re taking your first tentative steps into the world of mixers, it can seem an unnecessarily confusing one. How can a hand mixer cost anywhere from a fiver to triple figures? Why a hand mixer and not a stand mixer? What’s the deal with the different attachments? Well worry not, our budding Nigellas and Jamies — we’re here to help you find the best hand mixer. Before we share our favourite hand mixers, for those who find themselves frequently in the kitchen baking and cooking, why not find more appliance recommendations at our appliances hub page. WHY BUY A HAND MIXER? Essentially, a hand mixer combines ingredients together, and whether you're making a dough for pizza, some pancake batter or some mash potato, they definitely come in handy for those who like to get things done the quickest and easiest way possible. First of all, it's best to consider how much you'll be using your hand mixer. If it's just for the kids' birthday parties once a year, it's probably best to go for a cheaper, and easier to work model, but if you consider yourself the new Mary Berry and spend every weekend with flour all over the place, then it's definitely worth investing in a snazzier model with lots of attachments. The price, will of course, depend on how many functions, features and attachments the mixer has. Starting from around £5 for a basic supermarket model, be wary of false economy — here, we’ve chosen mixers ranging from just over £15 to around £100. However, if you’re a particularly keen baker, especially if you’re looking to make dough, and you have the scope to spend more, you could consider going for a stand mixer instead. But back to the task at hand: depending on what you’ll be using your hand mixer for most often, you’ll need a range of tools. Look for a model with a fixable bowl for the best of both worlds, with the ability to clear some space when not in use, which isn’t an option with a standalone mixer. To streamline your methods, and your cupboard, look for a hand mixer with a blender attachment included for chopping, blending, pureeing, and all manner of prep work. A mixer with the option for a balloon whisk attachment is a good bet for anyone making aerated recipes like soufflés and meringues, although standard flat beaters can be just as good so this isn't an absolute necessity. After that, it’s all about how it feels. Anyone who’s attempted hand-whisking before will know that it can be a tiring job, so unless you’re Arnold Schwarzenegger, or at least hitting the weights a few times a week, look for a lightweight model that won’t wear you out. And if you’re a bit of a butterfingers (figuratively or literally, depending on how messy a baker you are), look for one with great grip to avoid slippage. If you find yourself dipping into the recipe books a few times a week, this useful lightweight mixer is a great buy. With two beaters, two dough hooks and a balloon whisk included as attachments, it can manage all sorts of tasks, including bread-making, making it a must for the adventurous cook. And, good news for tired arms everywhere, it’s very lightweight, so you can keep going for longer when whisking meringue mix. So, if you're looking for a sturdy, versatile hand mixer that can switch easily from job to job, this is a great choice. Powerful yet still lightweight and incredibly durable, this Bosch hand mixer is ideal for those who need some help with their baking when it comes to whisking, kneading and beating. Not only does this hand mixer look good with its black and stainless steel cover, but it has four speed settings to choose from, and an additional turbo option for when a quick blast is needed. For those who like to perfect making dough, it has a kneading hook attachment which means you'll get some help making the dough smooth, and the best part is that all of the attachments are dishwasher-friendly, so there's less washing up for you to do at the end. A good-looking model from a trusted kitchenware brand, this Bodum hand mixer is a must-have for stylish cooks. Not only does it boast classic good looks and sleek branding, its cord rolls up inside the casing for easy, clutter-free storage, so it’ll look just as good on the top as in the cupboard. It comes with three detachable parts including a dough hook, all dishwasher safe for easy cleanup, and a soft-grip handle for comfortable mixing. If you have other Bodum accessories or gadgets in your kitchen, adding this one into the mix is a no-brainer. In our opinion, this is the best hand mixer you can buy if style is top of your mind. Packing an impressive 500W of power, the Russell Hobbs Easy Prep is far and away the most powerful mixer on our list, and as such the best for tough mixing jobs. If you regularly make dough and other heavy-duty mixables, this is the one. With five speed settings including a turbo boost (perfect for pulsing) making short work of most ingredients. The mixer also has integral storage for beaters and dough hooks, and a clip for its own cable, so everything can be kept together, saving on space and stopping things going walkabout. f you’re low on worktop or cupboard space, this little mixer is our recommended choice. It comes with a stand to hold the mixer and all its attachments neatly upright for tidy, clutter-free worktops. Its wattage is enough to handle most tasks without causing spillages, with a pulse function for quick blasts. Arguably its best feature is that it’s supremely comfortable to use, with a SureGrip handle and easy-access controls. The Kenwood k-Mix Hand Mixer is our top pick for the best hand mixer for small kitchens. If you like your appliances to match your retro aesthetic, look no further — this downright darling hand mixer from Swan is incredibly retro, with its ‘50s diner feel and unexpected range of attractive colours giving it the edge over monochrome competitors. It’s not all about the looks though; the stainless steel hardware is very easy to keep looking clean and sharp, and it has a turbo function for tough-to-mix ingredients. With 5 speed settings too, this vintage inspired hand mixer boasts enough features to get most baking and cooking mixing tasks done. Its considerable 400W of power and clever storage feature give this Duronic mixer a slight edge over many of the models on this list, making even stiff ingredients a breeze to mix and clearing up after even easier. 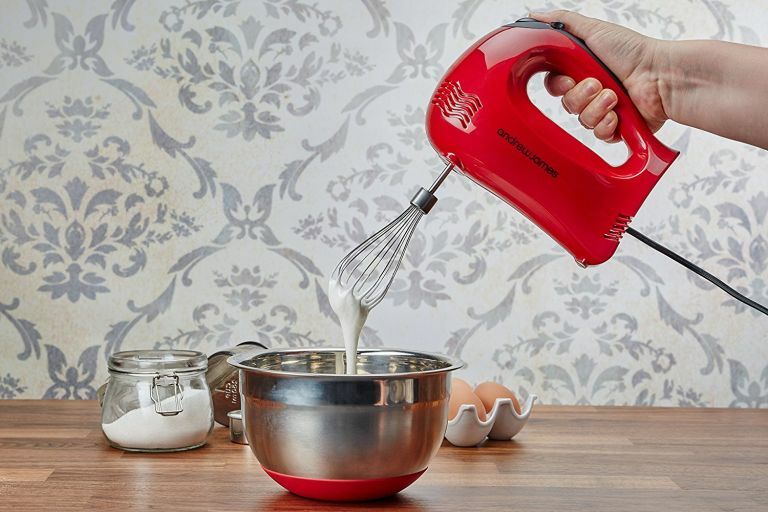 No doubt its best feature, though, is its weight (or lack thereof) — if your stamina isn’t the best when it comes to mixing, and you tend to come out of baking sprees feeling tired and sore, opt for this easy-on-arms lightweight mixer as it's our best hand mixer for achey arms. If you have little ones that like to get involved in baking or cooking, this manual whisk is an excellent buy. The lack of a motor means it’s pretty cheap when compared to the electric mixers on our list, so it’s worth purchasing as a second mixer, great for leaving them to it while you see to your own recipes. It also means that, unless your little ones are incredibly determined, there’s no risk of them trapping their fingers or suffering other motorised-beater-related injuries. A great, safe way to let children join in in the kitchen. With three handy attachments – universal beaters, dough hooks, and balloon whisks – the Andrew James Professional Hand Mixer makes light work of a myriad of tasks, making it a great all-rounder for any kitchen. It’s our best budget buy hand mixer, offering impressive performance for a pocket-friendly price, so it’s perfect for students who like to experiment in the kitchen, and for first-time movers who don’t want to spend a fortune just yet. Looking for more kitchen recommendations?